This is a shorter, easier and (for most of us) nearer hike: it should take 2-3 hours at a gentle pace. Even if you join others for coffee-shop refreshments afterwards, you can be home by lunchtime. We will enter the Doi Suthep National Park through one of the less-used access points, near San Lom Choi village, about 5km SW of Nimmanhaemin. The hike begins in the same way as the one we did up to Bhuping Palace on 12 August, but turns back early, to make a loop in the lower forest slopes. It is not particularly spectacular but a welcome immersion in greenery for people who like this sort of thing. It involves 30-60 minutes of steady climb, before the return part of the loop. The path is clear but may be a little muddy and slippery in places. Time: 07:50 for and 08:00 departure. 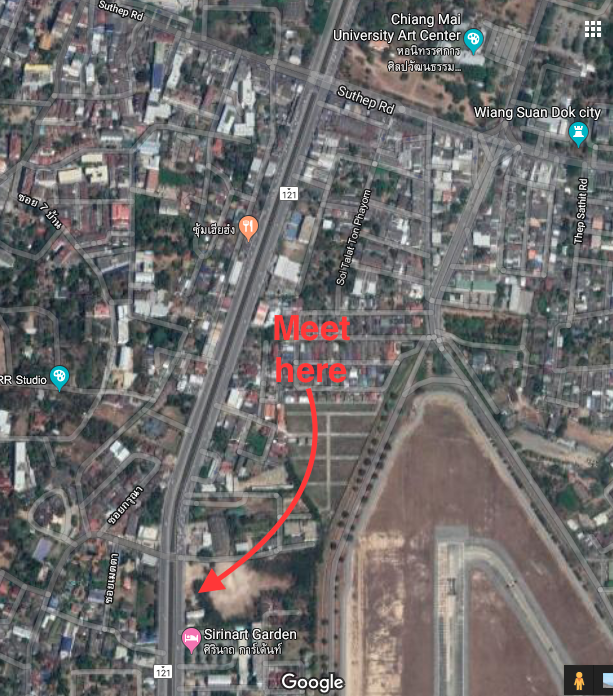 We will meet at an open area at the side of Canal Road, near the first set of traffic lights south of Canal Road’s intersection with Suthep Road, on the east side of the road. See map below. We will carpool to the starting point of the hike. If you want to join: be sure to have read the general advice on this website, as well as the details in this specific post. If you still think the hike is for you, just turn up at the specified place and time. No groups above family size. Places in cars are almost always available but cannot be guaranteed. Advice: as per the general advice on this site. As ever, bring energy, enthusiasm and good humour!